Although both middle grade, these books have basically nothing in common except that I finished both of them at the end of the year, and I wanted to get caught up with my reviews. This is probably the first (and last) time that they will ever be paired together. You know I love seasonal reading, and so I have been so grateful for Erica's list of Christmas chapter books, which she put together last year (her follow up list this year was also very good). It was because of this list that we read Nancy and Plum last year and The Family Under the Bridge this year. Both books were perfect complements to our holiday festivities, and I'm grateful there are still many books left for us to try during future Decembers. 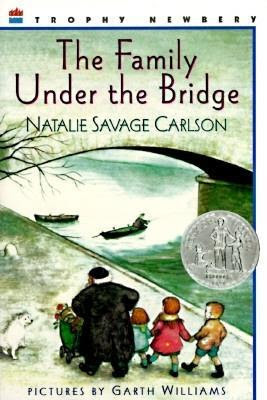 Set in Paris, The Family Under the Bridge stars an unlikely hero: an old hobo named Armand who enjoys his responsibility-free life and guards his heart against becoming attached to any people, particularly children. But then one day, he returns to one of his favorite spots under a bridge along the Seine and finds three small children occupying it instead. Having been evicted from their apartment, their mother moved them there while she continued to work and look for another home. Armand takes pity on the family (although he warns himself not to) and helps them find food. Their mother is very resistant to any sort of charitable help, but she finally realizes that her situation is such as to leave her no choice. This all happens during the month of December, and when the children have the opportunity to see Father Christmas, Suzy asks him for a real house for her family. The request seems impossible, but Armand finally realizes that he will give anything and be anyone if it means keeping those children safe and happy (that darn heart of his!). This story gave me a chance to try on my French accent, which is lacking in so many ways. In fact, as much as I loved the story and enjoyed sharing it with my kids, the French names and accents about did me in. Anytime Mike was within hearing range, I banished him from the room (he speaks French, and I was too embarrassed to let him hear me butchering his beloved language). I kept telling him he should be the one to read this one, and finally one evening, he volunteered to give it a try. After just a couple of pages, he admitted defeat. If the entire thing had been written in French, he would have been fine, but he was also having a hard time with the accent. Little by little though, the accent, although not authentic in anyway, became more comfortable to me, to the point that I actually started to enjoy reading it aloud. My kids are very forgiving, too, which gave me more confidence. The story is sweet and different (how many other stories can you think of about a homeless family and a friendly hobo?). It's also short, and I actually would have liked a little more, particularly between chapters seven and eight. Seven ends on Christmas Eve, and eight picks up after Christmas, skipping the big day entirely. Armand has already told the children that Father Christmas will not be bringing them a house for Christmas, but still, I felt like there had been a lot of buildup to Christmas Day, and then it passed with nary a word. The hole felt so blatant, in fact, that I kept turning back the pages because I was sure we'd accidentally overlooked a chapter, but no, the story really does brush over Christmas Day itself. The other part I was expecting more from was when the policeman returned to the gypsy camp (where Armand and the children had been staying) and finds that all of the gypsies have vanished. He has a wallet full of money that one of them lost at a cafe, and he was planning on returning it to him. For some reason, I thought that the money would somehow ending up helping Armand and the children, but it didn't. That's not to say that I didn't like the ending. It was actually one of the most touching and satisfying endings I've ever read. Sometimes it's better when your predictions don't pan out, and seeing Armand step up and become a responsible citizen was infinitely better than watching him inherit a large sum of money. After Aaron and I finished reading Sideways Stories From Wayside School, I figured he would just finish the other books on his own. I enjoyed the first book very much but felt like my time would be better invested reading a new series or author with him. However, as soon as he started the second book, he told me I had to read it. I don't know that he's ever told me that before, so I had to oblige. And honestly, it wasn't any sacrifice at all. It was a treat to share another of these funny books with him. It was a seamless continuation of the first book. More zany stories. More bizarre happenings. More wacky kids. A case of mistaken identity when everyone calls Benjamin Nushmutt Mark Miller (but Mark Miller is actually on the nineteenth story where everyone there calls him Benjamin Nushmutt). Each chapter feels kind of like a standalone story, but it isn't one. Details get tossed back and forth from chapter to chapter (and even between books), and after awhile, they start to feel like inside jokes, which makes you feel special and included that you know what's being referred to. For example, when Sharie brings a hobo to school, Rondie raises her hand to ask a question. The hobo calls on her by saying, "Yes, the girl with the cute front teeth." But, as anyone from the first book will know, Rondie is missing her two front teeth, but people are always complimenting her on them. Or there's the time when Jason needs a pencil so he can do a work sheet. Myron looks at the paper and says, "I don't feel like doing this stuff" and hands his pencil to Jason. In an earlier chapter, Myron signs for his freedom, and for some reason it was hilariously funny to me to see him so casually decide not to do his work. There is a tiny bit of rudeness that I didn't appreciate, but it was gloriously free of potty language, so I'm calling it a win. Afterwards, I checked out the audio version from the library, and now Maxwell is addicted to the series too (although, he listened to it one night as he was going to sleep and got a little freaked out when Mrs. Gorf's face suddenly appeared in Miss Mush's potato salad). 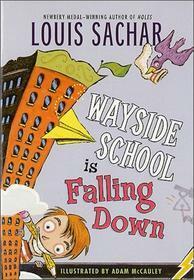 Now Aaron is telling me I have to read Wayside School Gets a Little Stranger, and I don't know that I'll be able to resist. Have you read either of these books? I'd love to hear your thoughts. Louis Sachar is so clever. Holes is clever like this too, but set in a story for a more mature audience. We love the Wayside books. And in my opinion, they get better as the series progresses. I'm glad you picked up the audio-- it's fun for me to hear the delight in his voice when he reads his crafty tales. The end of the 3rd book is like the big red bow that wraps the whole thing up together in satisfying cheesiness:). And 'Louis the Yard Teacher' is my favorite autobiographical character ever, I think. Yes, I love Holes! I think Aaron is about ready for that one. I'm going to try to convince Mike to read it along with him. :-) And yes to Louis the Yard Teacher! Such a clever way to get himself into the story!